Regattas have been popular since early colonial times, with crews of whalers and merchantmen initially competing informally. In 1831 the Hobart 'Arrow Club' organised Tasmania's first regatta, with eleven boats entering the single race, watched by a huge crowd. Boat racing continued, and in 1838 Lt-Governor Franklin instigated a large public regatta in Hobart, held in commemoration of Tasman's discovery of Van Diemen's Land. The crowd of 12,000 enjoyed fine weather and free cheese and beer as they watched the five races: one for four-oared gigs, two for sailing-boats, one for dinghies, and the main event, a race for fifteen whale-boats. The annual holiday was a highpoint in the economic boom of the 1830s and the colony's development, but later attracted criticism as a 'scene for colonial debauchery'. Junior to the Sydney Regatta by one year, the Hobart Regatta was first held off Pavilion Point (the site of Government House) but relocated to the Domain foreshore in 1856, when the governor objected to broken bottles and garbage left behind. Launceston's first official regatta, also supported by Franklin, was held in 1840 and offered attractive prizes for competitors in the seven races. Originally held at Stephenson's Bend, it moved to the more centrally located Royal Park in 1925. With limited other public entertainment available, Launceston streets were deserted as 'persons of all ranks and denomination, both pedestrian and equestrian' flocked to the foreshore to watch aquatic events and participate in onshore amusements such as hoopla, swings, skittles, chasing a pig with a greasy tail and pole climbing. 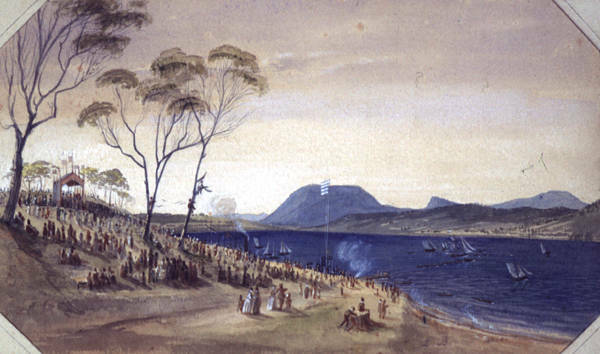 Kangaroo Bay's first regatta in 1853 was controversial. Outraged at pro-transportation Lt-Governor Denison agreeing to open the regatta, anti-transportationists organised an alternative event. Poor weather the following year meant several boats capsized and a ferry gangway collapsed: 'women, children and drunkards fell into the water, luckily without loss of life'. For sailors, the Kangaroo Bay, later Bellerive regatta was a highlight, whereas the Lindisfarne regatta (inaugurated in 1906) was renowned as an important rowing event. Regattas were a significant social and sporting outlet, particularly in the shipping transportation era before the 1930s. On the Tamar River, annual events were held at Rosevears, Sidmouth, Beauty Point, Low Head and George Town. Strahan's regatta, held on New Year's Day, was a great social event with most interest focused on the piners' punt races. Keen sailors could do a circuit of regattas at year's end: Port Esperance for the Dover regatta, to Southport, to Port Cygnet and then Shipwright's Point on New Year's Day. Though some regattas have disappeared, and the attractions at those remaining have diversified considerably, regattas remain popular public events and are held at various locations around the state. Further reading: A Alexander, The eastern shore, Rosny Park, 2003; J Branagan, The historic Tamar Valley, Launceston, ; The Tasmanian Cyclopedia, Hobart, 1931; B Valentine, 'Regatta Day', in P Richardson (ed), On the tide, Launceston, 2001.